Exactly why I put in the parameters of "in a dyno setting." They do use large fans of course. I have some other info that also might lend credence to the idea of not using the snorkel. but yeah... can't talk about that. So, my Kawasaki has a Ram Air induction system on the front cowling. At speed the claim is that it increases HP. How about doing the same thing for an Elise/Exige? Any thoughts on this? Well it certainly increases HP to have a ram air effect... about 0.1 HP maybe at 100mph. The problem is that air just does't compress itself that much when being rammed into a funnel until you get up near supersonic speeds. 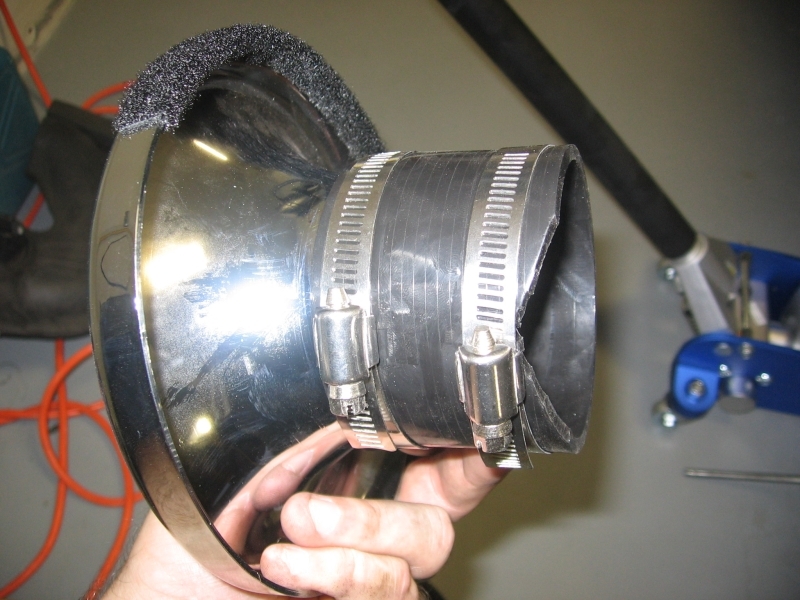 Would it be possible to remove the paper filter and mount a short conical K&N to the airbox? When I thought about it while doing my intake the flange on the airbox looked too short to me, but if you cut the filter flange the same way you cut the coupler for the funnel it might work. This was a good excuse to buy a low profile jack and the parts store I was at had the same parts you used. I found in my car that the velocity funnel might rub so I put some soft Velcro on top. Well it certainly increases HP to have a ram air effect... about 0.1 HP maybe at 100mph. The problem is that air just doesn't compress itself that much when being rammed into a funnel until you get up near supersonic speeds. Very good! I've been trying to explain this for years to car guys. Without getting into supersonic (compressible) fluid flow, the highest air pressure that you can get is static air pressure - the normal air pressure for things around us (generally considered to be 14.7 PSI at sea level. You can't get more than this with scoops, "ram air", or anything else (other than a supercharger). A scoop, etc., can increase the flow to the maximum available, but that's it. 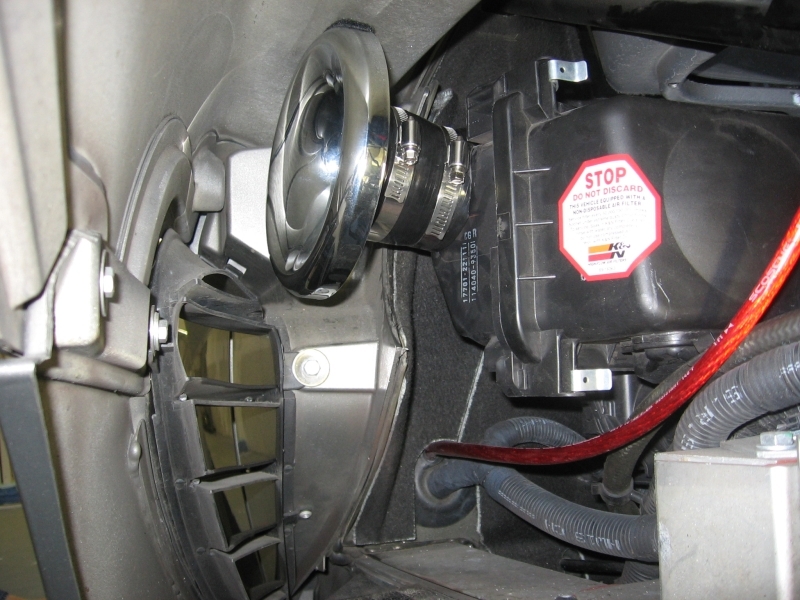 If an intake is restrictive, it may not see static air pressure. If an intake is somewhere that has high air flow moving past it, it may not see static air pressure (a slight "vacuum" may be created by the air flowing past, etc. In these cases, a scoop may help to increase the available air flow, but cannot increase the air pressure - you are not going to get any horse power gain from a "ram air scoop". In the case of the Elise, the air flow entering the side vents are pretty much going to make static air pressure. You aren't going to ram any more into there. However, the snorkel may restrict the air flow a bit, and removing it can help the air flow - not the air pressure. The funnel may or may not help to smooth out the air flow, but isn't going to do much to increase the air flow (or power). Tim the raw edges of the intake with the snorkel off causes turbulent flow over the edges. Of course it's been 20 years since I took my Fluid Dynamics course and I haven't done the calculations, but I believe effectively it could decrease the diameter of the opening of the box by something on the order of a quarter of an inch. Thus the airflow seen into the box is effected as if making the diameter of the opening smaller. The addition of the velocity funnel causes a laminar air flow over the edges, thus maximizing the diameter of the air box opening. I expected the changes in flow through the airbox really only when the Secondary Flap was closed, however, I can tell you that the sound of the engine is louder on and off the cam with the Funnel on as opposed to no Velocity Funnel nor Snorkel. I believe this increase in sound must be due better breathing of the engine. Your statement got me a little paranoid about possibly flexing the clam from the inside, so today I took my heat gun to the top of the funnel and flattened it out. I then took some of my daughters foam stickers from her craft bucket and placed them on the flattened section on the top. This gave me more clearance and allowed for the coupler to straighten out. Also the foam stickers act as a cushion to prevent any damage to clam if it were to slam into it. Correct me if I'm wroing, but it seems that just slapping any sized funnel will not automatically result in laminar flow. The radius of the bend would have to be tuned to the expected flow, and even that isn't constant. So at best it looks cool and makes more noise, and may possibly restrict the flow a bit less. Is that the gist of this? If what you're saying is that it's far from superior technology, has anyone developed a replacement that is? My understanding is that none of the aftermarket intakes provide increased HP at any rev range. I'm hoping you have news to the contrary as previous ET threads have not been hopeful. Then again, even if there was something better, would the ECU deny access to that power? Supposedly this funnel is tuned for a laminar flow under expected intake vacuum pressures. At least the manufacturer reports that. But your assumption about the gist is correct. Also you need to add, "It can't hurt the intake volume!" The gist is correct. It's just "field engineering" with the hope of reducing any pressure dropping restrictions a tiny bit. I too ran into the issue of the velocity funnel impacting the underside of the clam, but wonder if a 45 degree coupler verses the straight coupler would resolve having to either modify or pad the funnel to protect the clam. On the air box I can't say for certain, but I have done flow bench testing to compare an open intake pipe to one with a velocity stack like this one, and a properly AMSE engineered velocity stack cause increases of about 30 CFM and incerases in velocity as well in a 1.5" intake pipe when compared to just the pipe stickign up into air. That was at 18" of vacuum. Toyota already includes an engineered bellmouth cast in at the inlets of the intake runners in the plenum of the 2ZZ intake manifold. Again, this will not necessarily translate to a gain when you throw the box and filter etc. into the mix, but it MIGHT. It would not be hard to throw the box on a flowbench and find out either. 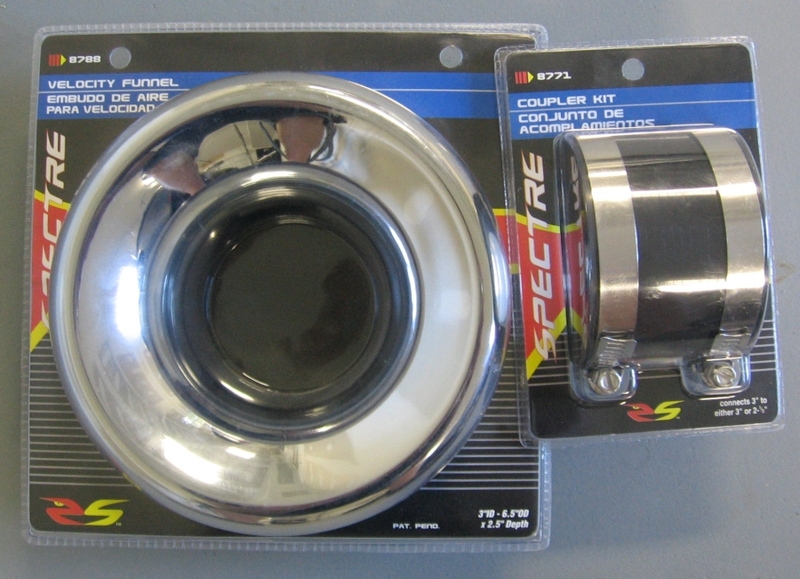 On a side note, if anyone wants to add one of these to the end of a CAI, Turbohoses.com sells them in larger sizes and filters to go on the end of them. Laminar flow isn't a big issue given the funnel location - the air has to pass through the filter and factory airbox flow straightener anyways. I'm going to try this mod tomorrow. Hi - is there any issue with throwing codes by removing the snorkel and using the stack? None yet and there really shouldn't be. Ram air does work at much less than supersonic speeds. Why do you think they have those big intakes above the driver's head on F1 and Indy cars? Basically you are increasing the inlet air density by converting the energy from the moving fluid (air) into higher pressure (and temperature) in the airbox. The pressure increase is proportional to the square of velocity. Assume some efficiency for this pressure recovery (>90% for a well designed snorkel). If you then use a standard power correction factor, you can determine how much additional power you can make by having the higher pressure in your airbox. At 100 mph, for example, you would have a little over 1% power increase. I know, it still doesn't sound like very much. Of course this won't work on your Elise unless you've got a big snorkel sticking out into the air. Then you'll need to determine if the additional power overcomes the extra drag!